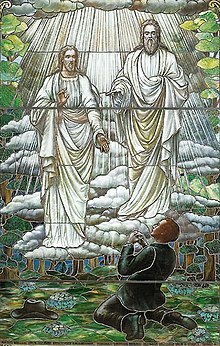 Depiction of God the Father and Jesus as two distinct beings appearing to Joseph Smith, Jr. during his First Vision, reflecting Mormonism's nontrinitarian theology. Mormonism and Christianity have a complex theological, historical, and sociological relationship. Mormons express the doctrines of Mormonism using standard biblical terminology and have similar views about the nature of Jesus' atonement, bodily resurrection, and Second Coming as traditional Christianity. Nevertheless, most Mormons do not accept the Trinitarian views of orthodox Nicene Christianity, codified in the Nicene and Nicene-Constantinopolitan Creeds of 325 and 381; Mormonism is the largest nontrinitarian denomination within Christianity. Though Mormons consider the Bible as scripture, they do not believe in biblical inerrancy. They have also adopted additional scriptures, including the Book of Mormon, the Doctrine and Covenants, and the Pearl of Great Price. Mormons practice baptism and celebrate the Sacrament, but they also participate in religious rituals not practiced by traditional Christianity. Focusing on differences, some Christians consider Mormonism "non-Christian"; Mormons, focusing on similarities, are sometimes offended at being so characterized. Mormons do not accept non-Mormon baptism nor do non-Mormon Christians usually accept Mormon baptism. Mormons regularly proselytize individuals actually or nominally within the Christian tradition, and some Christians, especially evangelicals, proselytize Mormons. Some view Mormonism a form of Christianity, but distinct enough from traditional Christianity so as to form a new religious tradition, much as Christianity is more than just a sect of Judaism. The Mormonism that originated with Joseph Smith in the 1820s shared strong similarities with some elements of nineteenth-century Protestant Christianity. Mormons believe that God, through Smith and his successors, restored various doctrines and practices that were lost from the original Christianity taught by Jesus. For example, Smith, as a result of his "First Vision", primarily rejected the Nicene doctrine of the Trinity and instead taught that God the Father, his son Jesus Christ, and the Holy Ghost are three distinct "personages". While the largest Mormon denomination, The Church of Jesus Christ of Latter-day Saints (LDS Church), acknowledges its differences with mainstream Christianity, it also focuses on its commonalities such as its focus on faith in Christ, following the teachings of Jesus Christ, the miracle of the atonement, and many other doctrines. With roots within radical Protestantism of the 1820s and 1830s, Mormonism soon diverged dramatically from traditional Christianity. Mormonism arose in the 1820s during a period of radical reform and experimentation within American Protestantism, and Mormonism is integrally connected to that religious environment. As a form of Christian primitivism, the new faith was one among several contemporary religious movements that claimed to restore Christianity to its condition at the time of the Twelve Apostles. The Book of Mormon (1830), which codifies the earliest Mormon doctrine, was intended, in part, to settle ongoing doctrinal disputes among contemporary Christian denominations and to create a single shared theology. Joseph Smith believed in the Bible and shared the Protestant tradition that the Bible (excluding the Apocrypha) was originally revealed by God to humanity and had contained the "fulness of the gospel." Nevertheless, Smith believed the Bible of his era had degenerated from its original form. Smith blamed the Catholic Church for the loss of biblical books and for introducing corruptions and obfuscations in the biblical text. Smith said that the Book of Mormon revealed "plain and precious things that had been taken away" from the Bible. Smith also completed an unpublished revision of the Bible in 1833, which he said corrected many of these errors, and added inspired commentary. Smith endowed the Book of Mormon with status equal to the Bible. There are two personages who constitute the great, matchless, governing, and supreme power over all things, by whom all things were created and made, that are created and made..They are the Father and the Son-the Father being a personage of spirit, glory, and power possessing all perfection and fullness, the Son, who was in the bosom of the Father, a personage of tabernacle. It is possible that Joseph Smith simply did not understand the corporeal or physical nature of God at the time the Lectures on Faith were delivered. His knowledge of things-like that of all men and women-was often incremental, and his development in understanding was therefore a "line upon line" development. As a result of the First Vision, the boy prophet knew that the heavens were no longer sealed; that satan was more than myth or metaphor; and that the Father and Son were separate and distinct personages. They (The Mormons) believe that the true God is a material being, composed of body and parts; and that when the Creator formed Adam in his own image, he made him about the size and shape of God himself. Kurt Widmer stated that "early Mormons were reacting against a heavily intellectualized and theologized Trinitarian concept of God" and the nature of God was not at first of central importance to Smith. Early Mormon soteriology, although not following a preexisting tradition, was generally Arminian in tendency. Early Mormonism agreed with Methodists and the Disciples of Christ in rejecting Calvinistic doctrines in favor of Christian perfection and free will (called free agency). Also, while the Book of Mormon affirmed the doctrine of original sin, it also agrees with other Arminian denominations that children are incapable of sin and in a state of grace. Like other Christian primitivists, Smith located the authority of Christianity in correct interpretation of the Bible—although he also maintained (as did the Shakers) that interpretation of the Bible should be guided by new and continuing revelation. Initially, the authority of Smith's faith was based on correct doctrine and his own claim of prophethood. Then during the early 1830s, Smith added to this authority apostolic succession, represented by angelic apostles and prophets who Smith said had ordained him. From the mid-1830s to his death in 1844, Smith continued to introduce ideas and practices which differed significantly from traditional Protestantism. First, Smith pressed Christian perfection beyond Protestant orthodoxy. He followed non-Protestant Christians in rejecting the doctrine of justification by faith alone and moved toward universalism by introducing a hierarchy of three glorious heavens, in which even the wicked had a place. In the late 1830s, Smith introduced baptism for the dead by proxy as a means for unredeemed souls to accept salvation in the afterlife, and he also taught that the ordinance of marriage was required to reach the highest level of salvation. Smith also introduced a second anointing ritual, after which a participant was guaranteed virtually unconditional salvation. This has been seen as an attempt to retain the Calvinistic ideas of assured salvation. In his later years Smith also differed from traditional Protestantism in his views on the nature of God and humanity. Eventually Smith reduced the difference between God and man to one of degree. Both God and man are coeternal and uncreated. He taught that humans could progress to an exalted state in which they became coequal with a God who was material, plural, and himself a glorified man existing within time. Smith taught that both God the Father and Jesus were distinct beings with physical bodies, and that the Holy Spirit was a personage of Spirit. Because God had once been a man who had risen to a high position in heaven, humans too could progress to godhood. Such a teaching implied a vast hierarchy of gods who would rule kingdoms of inferior intelligences, and so forth in an eternal hierarchy. Unlike the god of traditional Christianity, the god envisioned by Smith did not create the eternal spirits of humanity—he only organized them and provided them with a plan to follow in his footsteps. God was God not because he was an ex nihilo creator, but because he had the greatest intelligence. After Smith's death, his successor Brigham Young and others built upon Smith's late teachings and introduced more significant doctrinal innovations. The resulting religious tradition defined the Mormonism of the Mormon pioneer era in the 19th century. An important part of this pioneer Mormonism is the Adam–God doctrine, which became the most prominent (but not exclusive) theology of 19th-century Mormonism. Young taught that God the Father was Adam, a mortal man resurrected and exalted to godhood. Proponents of this doctrine believed that Father Adam, as the subordinate member of a three-god council, created the earth. Adam was both the common ancestor and the father of all spirits born on the earth. After ascending again to his heavenly throne, Adam returned to physically father Jesus by Mary. Some elements of Mormonism from the pioneer era, including polygamy and the Adam–God doctrine, were renounced around the turn of the 20th century by the LDS Church. However, these elements have been retained within the small branch of Mormonism known as Mormon fundamentalism. Near the turn of the 20th century there was a movement to codify LDS theology with official statements of Church leaders — which served to quash speculative ideas that persisted as sub rosa concepts among some Mormons. This coincided with an effort to stop new plural marriages — mostly forbidden in 1890 and completely forbidden after 1904. Prominent Mormons such as Joseph F. Smith, John A. Widstoe, and James E. Talmage formulated the outlines of Mormon orthodoxy with publications that significantly narrowed the realm of acceptable speculative Mormon theology. In traditional Christianity, as expressed in the Athanasian Creed, God is conceived both as a unity and a Trinity: God the Father, God the Son, and God the Holy Spirit are described as three persons of one uncreated divine being, equally infinite, eternal, and unchangeable. Though modern Mormons share with traditional Christianity a belief that the object of their worship comprises three distinct persons, Mormon theology disagrees with the idea that the three persons are the same being. Mormons are constrained by the language of the Book of Mormon to regard the Father, Son, and Holy Spirit as "one", but consider this a social unity rather than ontological. Mormons since the time of Joseph Smith have regarded God as plural. They regard God the Father as the biblical god Elohim, and they believe that the Son, a distinct being, is both Jesus and the biblical God Jehovah. The two of them, together with the Holy Spirit, are believed to form a heavenly council which Mormons call the "Godhead". They are "one" in the sense of being lovingly united in purpose or will, a view sometimes called social trinitarianism. Unlike traditional Christians, modern Mormons generally regard the Son as subordinate to the Father. Mormons since the 1840s have believed that God is changeable. They believe that the Father (like the Son) was twice "born"—once as a spirit, and again as a mortal man. After he lived a mortal life, Mormons believe that the Father died, was resurrected, and achieved his godhood along with at least one wife whom Mormons refer to as the Heavenly Mother. Some believe that the Heavenly Father and Mother gave birth to the spirits of humanity through a sexual union. Modern Mormons believe that Jesus, the Son, was the first born of these spirits. While Mormons might agree with the statement that the Father and the Son are "uncreated", their understanding of "creation" differs from that of traditional Christianity. Mormons do not believe, as do traditional Christians, that God created the universe ex nihilo (from nothing). Rather, to Mormons the act of creation is to organize or reorganize pre-existing matter or intelligence. Traditional Christians consider God to be a "necessary being", meaning that he cannot not exist, while all other creations are "contingent beings". In Mormonism, by contrast, every god and human is equally a necessary being. The Mormon sense of "eternal" differs from that of traditional Christians, who believe that God's eternal nature exists outside of space and time. Some situate the Mormon God within space and time. However, Mormon scripture states that "time is measured only unto man." They believe that the Father, Son, and Holy Spirit are co-eternal, but they also believe that all of humanity is co-eternal with the Father in the sense that the underlying spark of all intelligence has always existed (in space and time) and never was created. Mormons believe that God is scrutable through revelation, and anthropomorphic, in that he has a physical body of flesh and bone. Although Mormons do believe in traditional Christian notions that God is omnipotent and omniscient, modern Mormons also believe that "[e]ven God's omnipotence must conform to the attributes of truth and wisdom and justice and mercy". Although the LDS Church has never officially adopted a doctrine of soteriology, most Mormons accept the doctrine of salvation formulated by B. H. Roberts, John A. Widstoe, and James E. Talmage in the early 20th century. In contrast to early Mormons, modern Mormons generally reject the idea of original sin. The Fall of Man is viewed not as a curse but as part of God's Plan of Salvation. Mormons believe they must not only have faith and repent but also be baptized (by immersion and by a Mormon priesthood holder) and bring forth good works. Mormons consider their weekly Eucharist (the Sacrament) as a means of renewing their baptismal covenant and being repeatedly cleansed from sin. Although the grace of Jesus plays a role in salvation, each Mormon must "work out his own salvation". Mormons believe that people not baptized during their lifetime may accept salvation in the afterlife through the Mormon practice of baptism for the dead. Although the Book of Mormon rejected the doctrine of universal reconciliation, Smith later taught that damnation was a temporary state from which the wicked would ultimately escape after they had paid for their sins, to be resurrected into one of the two lesser kingdoms of glory. Mormonism takes an extended view of Christian perfection, asserting that through the grace of Jesus, Mormons may become perfectly sanctified and thereby literally become gods or achieve a state known as exaltation. To achieve exaltation, Mormons must remain obedient to the teachings of Jesus, receive all the ordinances (or sacraments), which includes baptism, confirmation, receiving the Melchizedek priesthood (for males), the temple endowment, and being sealed to a spouse. To "make sure" the election of believers, Smith introduced a second anointing ritual, whose participants, upon continued obedience, were sealed to exaltation. Like Catholicism and Orthodoxy, Mormonism assigns considerable authoritative status to church tradition and ecclesiastical leadership. Mormons emphasize the authority of an institutional church, which in all Mormon denominations derives from the Church of Christ established by Joseph Smith in 1830. Mormons believe this church to be the "only true and living church." Below Jesus as the head of the church is a single man chosen as the "Prophet" who holds the position of President of the Church. The Prophet has been compared to the Pope in Catholicism because both, within their respective faiths, are regarded as the leading authority. Mormons also believe in apostolic succession. However, Mormons believe the Catholic line of succession is invalid because of a Great Apostasy that occurred soon after era of the apostles. The line of succession was restored through Joseph Smith when biblical prophets and apostles appeared to him and ordained him through the laying on of hands with lost priesthood authority. Thus, Mormons believe that non-Mormon clergy have no heavenly authority and that sacraments performed by clergy of other faiths are of no effect in the eyes of God. Mormons reject the Protestant doctrine of the "priesthood of all believers", but they consider all confirmed Mormons to have the "Gift of the Holy Ghost" (also conveyed by the laying on of hands), which entitles believers to spiritual gifts but to no ecclesiastical authority. Some claim that in the late-20th century, a conservative movement within the LDS Church (called "Mormon neo-orthodoxy" on the analogy of an earlier Protestant neo-orthodoxy) emphasized the Book of Mormon over later revelations and embraced original sin, an absolute, eternal, and unchanging God, a pessimistic assessment of human nature, and a doctrine of salvation by grace rather than by works. Despite the book's importance to early Mormonism, early Mormons rarely quoted from the Book of Mormon in their speeches and writings. Joseph Smith's later teachings and writings focused on the Bible, including his own revision and commentary of the Authorized King James Version. The book was not regularly cited in Mormon conferences until the 1980s. Within the LDS Church, a movement to re-emphasize the Jesus-based elements of Mormonism in the 1980s included a rediscovery of the Book of Mormon. In 1982, the church subtitled the book "Another Testament of Jesus Christ", to emphasize that Jesus was a central focus of the book and that the book is intended to be a complement to the Bible. Although Mormon neo-orthodox scholars say they have faced "resistance" from Mormon orthodoxy, some perceive the direction of the movement to be consistent with a broader trend among the LDS hierarchy to present Mormonism in terms more acceptable to mainline Christianity. Critics argue that because Mormonism is not based on an authoritative systematic theology, and much of Mormon scripture was written when Mormonism was "essentially trinitarian", Mormon leaders and apologists have been able to deny that at least some of 20th-century orthodox Mormonism represents official Mormon doctrine. It is also claimed that LDS Church publications and a few Mormon scholars have increasingly used the language of Nicene Christianity to describe the nature of God. The existence and implications of the movement continues to be debated. Theologian Richard Mouw asserts that Mormons have downplayed some of its more "heretical" doctrines in order to obtain more effective dialogue with other Christians. Terryl Givens, a Mormon theologian, has rejected such claims, asserting instead that many Mormon "heresies" eventually become more accepted by much of Christianity. He consequently contends that "Christian consensus is fluid and, in some cases, has lagged behind the Mormon model." In the past, most mainstream Christian denominations rejected Mormonism outright, frequently calling it a cult and characterizing it as "non-Christian." Although mainstream Christian denominations still reject Mormons as being non-Christian, the image of Mormonism has metamorphosed during the 20th century in large part due to an evolution of Mormon theology and partly due to a deliberate effort on the part of the leadership of the LDS Church. According to Jan Shipps, during the 1950s the attitude of mainstream Christians towards Mormonism changed from "vilification" to "veneration," with emphasis on positive Mormon traits such as "family orientation, clean-cut optimism, honesty and pleasant aggressiveness." an evolution of Mormon thought toward doctrinal positions nearer those of evangelicals. Richard Bushman asserts that, for many people, Mormonism "conjures up an assortment of contradictory images". One set of images suggests that Mormons are "happy, uncomplicated, kindly and innocent—if perhaps naive". In contrast to this set of images, Bushman describes a set of associations that focuses on "a powerful religious hierarchy controlling the church from the top". This perspective views Mormons as "secretive, clannish and perhaps dangerous", often labeling the movement as a "cult rather than a church". Stephen E. Robinson has argued that Mormons are labeled heretics "for opinions and practices that are freely tolerated in other mainstream denominations." Mormonism has a particularly rocky relationship with American Evangelical Christianity. However, the view of Mormonism being non-Christian or a cult is not a uniformly held belief among Evangelicals, especially with those that have personal experience with Mormons in their community. Richard J. Mouw, President of Fuller Theological Seminary, an evangelical school in Pasadena, California, stated in a recent opinion piece for CNN, "[t]hose of us who have made the effort to engage Mormons in friendly and sustained give-and-take conversations have come to see them as good citizens whose life of faith often exhibits qualities that are worthy of the Christian label, even as we continue to engage in friendly arguments with them about crucial theological issues." William Saletan has been more blunt about this, stating "[w]hy don't we challenge anti-Mormonism? Because it's the prejudice of our age." Joe Scarborough has drawn analogies between the Pharisees in the New Testament and prominent evangelical religious leader Robert Jeffress calling Mormonism a cult. Latter Day Saint history comes from the position that other churches were the product of the apostasy, as referenced in the Bible. Mormons view other Christian churches as teaching some truth, doing good works, and acknowledge their strong faith in Christ. However, Mormons also maintain that all other churches lack the divine authority to perform the ordinances of the gospel because of the Great Apostasy. The LDS Church and most other Latter Day Saint factions do not accept the baptisms of other Christian denominations as valid. The Catholic, Orthodox, and Protestant branches of Christianity reject Mormon claims of additional scriptures, and of the prophetic office of Joseph Smith and other Mormon leaders; they disagree with Mormon charges that they have committed apostasy. Doctrines such as the beliefs about the existence of prophets in early American civilizations, which are unique to Mormon theology and not found in the teachings of other Christian churches are also causes of disagreement. Nonetheless, many Christian denominations treat Mormons with respect, while not minimizing the differences in belief. In 2001, in the Roman Catholic Church, the Vatican's Congregation of the Doctrine of the Faith decided not to accept Latter-day Saint baptisms as valid. The Catholic Church generally recognizes baptisms from other Christian faiths in the name of the Trinity, provided the person baptizing intends to do as the Church intends. However, because of differences in Mormon and Catholic beliefs concerning the Trinity, the Catholic Church stated that Mormon baptism was "not the baptism that Christ instituted." The Catholic Bishop of Salt Lake City, George Hugh Niederauer, stated that this ruling should not be a statement of the LDS relationship with Jesus Christ. The Church of Jesus Christ of Latter-day Saints, like the Presbyterian Church (U.S.A.), declares allegiance to Jesus. Latter-day Saints and Presbyterians share use of the Bible as scripture, and members of both churches use common theological terms. Nevertheless, Mormonism is a new and emerging religious tradition distinct from the historic apostolic tradition of the Christian Church, of which Presbyterians are a part. ... It is the practice of the Presbyterian Church (U.S.A.) to receive on profession of faith those coming directly from a Mormon background and to administer baptism. ... Presbyterian relationships with Latter-day Saints have changed throughout the twentieth century. By God's grace they may change further. Although Mormons may use water—and lots of it—and while they may say "Father, Son, and Holy Spirit," their teaching about the nature of God is substantially different from that of orthodox, creedal Christianity. Because the Mormon understanding of the Word of God is not the same as the Christian understanding, it is correct to say that Christian Baptism has not taken place. The Church of Jesus Christ of Latter-day Saints, by self-definition, does not fit within the bounds of the historic, apostolic tradition of Christian faith. This conclusion is supported by the fact that the LDS Church itself, while calling itself Christian, explicitly professes a distinction and separateness from the ecumenical community and is intentional about clarifying significant differences in doctrine. As United Methodists we agree with their assessment that the LDS Church is not a part of the historic, apostolic tradition of the Christian faith. The Episcopal Church (USA), part of the 80-million-member Anglican Communion, does not have an official position on the validity of Mormon baptism; however, most traditional clergy would not accept Mormon baptism and require the baptism of Mormons entering into the Episcopal Church. Retired bishop Carolyn Tanner Irish of the Episcopal Diocese of Utah was baptized into the LDS Church at the age of 8, her baptism was deemed valid upon her entering into the Episcopal Church in 1977, where she was confirmed by bishop of Washington, Rev. John T. Walker. As with the United Methodist Church, the Episcopal Church does not recognize Mormons as historic Apostolic Christians, but rather as a new and unique religious movement that is an offshoot of Christianity. Many other Christian churches also seek to teach or convert Mormons when the opportunity arises. Traditional Christian leaders often encourage their followers to follow the admonition of and witness to others using gentleness and respect. Like their Mormon counterparts, those from the traditional Christian religions assert that these proselytizing efforts arise out of love and genuine concern for others and not a desire to cause contention. Consequently, though the feelings may be strong, there is often a feeling of mutual appreciation and respect that accompanies missionary efforts on both sides (though this is not always the case). Some traditional Christian denominations have ministries focused on Mormons, just as they also have ministries toward Jews, Native Americans, or other demographic groups. For example, the 1998 convention of the Southern Baptist Convention held in Salt Lake City had the stated aim to "bring Christianity to the Mormons." There are also many independent ministries and organizations focused on Mormons. A 2007 Pew Poll showed that 31% of the general public in the United States believe that Mormons are not Christians. Similar polls have concluded that over two-thirds of the general public view Mormons as members of the larger Christian community, including many independent evangelical ministries and prominent evangelical leaders. However, in an October 2010 poll conducted by LifeWay Research, three out of four American Protestant pastors did not believe that Mormons were Christians. In the 1960s, the LDS Church formed the Church Information Service with the goal of being ready to respond to media inquiries and generate positive media coverage. The organization kept a photo file to provide photos to the media for such events as temple dedications. It also would work to get stories covering Family Home Evening, the church's welfare plan and the church's youth activities in various publications. As part of the church's efforts to re-position its image as that of a mainstream religion, the church began to moderate its earlier anti-Catholic rhetoric. In Bruce R. McConkie's 1958 edition of Mormon Doctrine, he had stated his opinion that the Catholic Church was part of "the church of the devil" and "the great and abominable church" because it was among organizations that misled people away from following God's laws. In his 1966 edition of the same book, the specific reference to the Catholic Church was removed. In 1973, the LDS Church recast its missionary lessons, making them more family-friendly and focused on building on common Christian ideals. The new lessons, named "A Uniform System for Teaching Families", de-emphasized the Great Apostasy, which previously held a prominent position just after the story of the First Vision. After a further revision in the early 1980s, the lessons dealt with the apostasy even less conspicuously by moving its discussion from the first lesson to later lessons. The lessons also became more family-friendly, including a flip chart with pictures, in part to encourage the participation of children. In 1995, the church announced a new logo design that emphasized the words "JESUS CHRIST" in large capital letters. According to Bruce L. Olsen, director of public affairs for the church, "The logo re-emphasizes the official name of the church and the central position of the Savior in its theology. It stresses our allegiance to the Lord, Jesus Christ." In 2001, the church sent out a press release encouraging reporters to use the full name of the church at the beginning of news articles, with following references to the "Church of Jesus Christ". The release discouraged the use of the term "Mormon Church". Riess and Tickle assert that, starting in the late twentieth century, Mormons have focused their attention on Jesus Christ more than at any other time since the inception of their faith. Some critics of the LDS Church have accused church leaders of attempting to disingenuously portray the church as "just another Christian denomination" when, in fact, there are significant differences. Riess and Tickle argue that these critics are failing to grasp that this recent emphasis on Jesus Christ is part of a genuine theological evolution that concurrently involves a renewed interest in the Book of Mormon. Ross Anderson asserts that, "(i)n public, LDS spokesmen downplay their Church's distinctive doctrines." Patricia Limerick suggests that future historians may conclude that, in the last four decades of the 20th, the general authorities of the LDS Church "undertook to standardize Mormon thought and practice". According to Limerick, this campaign of standardization has led to a retreat from the distinctive elements of Mormonism and an accentuation of the church's similarity to conventional Christianity. According to Claudia Bushman, "[t]he renewed emphasis on scripture study, especially the Book of Mormon, led the Church away from speculative theology. The freewheeling General Conference addresses of earlier years, elaborating unique LDS doctrines, were gradually replaced with a basic Christian message downplaying denominational differences." Recent church presidents have tended to downplay those doctrines that served to distinguish Mormonism from mainline churches. Richard Abanes asserts that President Gordon B. Hinckley "on numerous occasions demonstrated his willingness to seriously downplay any issues that might be construed as controversial." In 2001, Hinckley stated that message of the LDS Church was "Christ-centered. [Christ is] our leader. He's our head. His name is the name of our church." When speaking about other faiths, modern LDS leaders have adopted a policy of avoiding the use of critical and judgmental language in official church publications, and encouraged members of the church to be respectful of the beliefs of others as they witness in their personal lives. When speaking about other faiths, church magazines are often complimentary and focus on providing factual information rather than on sensationalizing or otherwise seeking to undermine the creeds and practices of others. Several presidents of the LDS Church over the years have emphasized the need for Mormons to recognize the good contributions those of other faiths make to the world. Ron Rhodes asserts that, "The Mormon church has in recent years sought to downplay its exclusivism as the 'restored' church. Indeed, the Mormon church has increasingly become involved with the Interfaith movement, joining with various Christian denominations in various charities." Traditional Christian denominations and the LDS Church share work in providing welfare or humanitarian aid. In recent years, the LDS Church has opened its broadcasting facilities (Bonneville International) to other Christian groups, and has participated in the VISN Religious Interfaith Cable Television Network. There have been independent activities among individuals from both traditions who attempt to discuss openly about issues of faith. In November 2004, Fuller Theological Seminary President Richard Mouw, and Ravi Zacharias, a well known Christian philosophical apologist, addressed a congregation of Mormons and Evangelicals gathered in the Salt Lake Tabernacle for an event sponsored by Standing Together Ministries that was well received despite the differences they acknowledged between Mormonism and the Christian Evangelical perspectives. When you go into a neighborhood to preach the Gospel, never attempt to tear down a man's house, so to speak, before you build him a better one; never, in fact, attack any one's religion, wherever you go. Be willing to let every man enjoy his own religion. It is his right to do that. If he does not accept your testimony with regard to the Gospel of Christ, that is his affair, and not yours. Do not spend your time in pulling down other sects and parties. We haven't time to do that. It is never right to do that. If we would secure and cultivate the love of others, we must love others, even our enemies as well as friends ... I possess the principle of love. All I can offer the world is a good heart and a good hand. The Saints can testify whether I am willing to lay down my life for my brethren. If it has been demonstrated that I have been willing to die for a "Mormon", I am bold to declare before Heaven that I am just as ready to die in defending the rights of a Presbyterian, a Baptist, or a good man of any other denomination. ... It is a love of liberty which inspires my soul. Because Mormon missionaries proselytize to all, including other Christians, some Christian organizations have published tracts, brochures and books designed to counter these missionary efforts. Conciliar Press, a department of the Antiochian Orthodox Christian Archdiocese of North America, has published a brochure designed to inform Orthodox Christians of the proselytizing efforts of what it describes as "cultists" (Mormons and Jehovah's Witnesses). In 2006, the Catholic bishops in Slovakia urged all Catholics in the country not to sign a petition allowing the LDS Church to be legally recognized in that country. ^ Shipps (1985, pp. 148–49) (arguing that "Mormonism differs from traditional Christianity in much the same fashion that traditional Christianity ... came to differ from Judaism."). ^ Porter, Bruce D. (2008). "Is Mormonism Christian?". www.firstthings.com. First Things. Retrieved 4 April 2019. ^ Stark & Neilson (2005, p. 14). ^ Shipps (2000, p. 338). ^ Turner, John G. (2016), The Mormon Jesus: A Biography, Cambridge, Massachusetts and London: Belknap Press of Harvard University Press, p. 5, ISBN 9780674737433 . ^ Smith, Joseph Fielding (1956). Doctrines of Salvation. Bookcraft. p. 1:38. ^ See, commentary, "Real Differences, Real Similarities and Biblical Christianity Mormon News Room, last 11 October 2007." ^ Brooke (1994, p. xv) ("Mormonism springs from the sectarian tradition of the Radical Reformation, in fact from its most extreme fringe."). ^ Brooke (1994, p. 200) (describing Smith's evolving theology as "a radical departure from traditional Protestant Christianity."). ^ Gordon (2002, p. 11); Shipps (1985, p. 7). ^ Paul C. Gutjahr (March 25, 2012). The Book of Mormon: A Biography (Lives of Great Religious Books). Princeton University Press. ISBN 978-0-691-14480-1. ^ Hill (1969, pp. 1–4) (describing the background of Christian primitivism in New England). ^ Hullinger (1992, p. 4) ("The Book of Mormon settles doctrinal differences among those who accept the Christ it presents. Mormon's purpose is to make clear the true doctrine and to dissolve doctrinal disputes by explaining the gospel of Christ"); Ford (2005, pp. 75–76) ("[T]he Book of Mormon decides controversies in a number of areas, including those argued among early nineteenth century American theologians."). ^ DePillis (1966, p. 88) (noting that the Book of Mormon expresses contempt for sectarianism, and arguing that establishing the one true fold and one true faith are the "only real theological themes of the book"); Hullinger (1992, p. 32) (the Book of Mormon "would seek to heal the wounds of sectarianism and defend God against deism, rationalism, and sectarianism."). ^ Hullinger (1992, pp. 153–54); Hill (1969, p. 5). ^ Hullinger (1992, p. 154); Hill (1969, p. 5). ^ Hullinger (1992, p. 154). ^ Hill (1969, p. 5); Hullinger (1992, pp. 154–55). ^ Bushman (2005, p. 142) (noting that though Smith declared his revision of the Bible complete in 1833, though the church lacked funds to publish it during his lifetime). ^ The LDS Church has canonized only a small part of this translation. However, see Ostling & Ostling (2007, p. 296) (noting that the most significant parts of Smith's revision of the Bible are found as footnotes and study materials in the LDS Church edition of the Authorized King James Version). ^ "Q&A: Questions and Answers". New Era. April 1977. Archived from the original on 2015-10-21. Retrieved 2015-09-18. ^ Alexander (1980, pp. 24–25) (describing the pre-1835 theology as "essentially trinitarian"); Widmer (2000, pp. 30, 59) (calling Book of Mormon theology "layman's Trinitarianism"); Kirkland (1986, p. 77) ("The Book of Mormon, revelations in the Doctrine and Covenants prior to 1835, and Smith's 1832 account of his First Vision all reflect 'trinitarian' perceptions. "); Kirkland (1984, p. 37) ("While the Book of Mormon theology does not reflect a truly orthodox trinitarian view as codified in the Athanasian creed, it does reflect the common Christian layman's perception that is some manner, the Father and the Son were both representations of one God. "); Lindgren (1986, pp. 72–73) (noting that Book of Mormon theology was similar to trinitarianism, but ultimately was "modalistic Monarchianism"). ^ "Lectures On Faith". mormonbeliefs.com. Archived from the original on 2005-10-28. ^ "Joseph Smith and Modern Mormonism: Orthodoxy, Neoorthodoxy, Tension, and Tradition". byu.edu. ^ "Truman Coe's 1836 Description of Mormonism". byu.edu. ^ Widmer (2000, pp. 30, 31) ("What is apparent is that early Mormons were reacting against a heavily intellectualized and theologized Trinitarian concept of God."). ^ Alexander (1980, p. 26) (noting that early Mormon doctrine "saw man as a creature of God, but capable of sanctification"); Matzko (2007, p. 73) (noting similarities with Arminianism, and disagreeing that the Book of Mormon incorporates Calvinist doctrine); Ford (2005, p. 77) (arguing that while the Book of Mormon agrees with some tenets of Arminianism, it "integrates doctrines from a variety of preexisting theological perspectives and some apparently unique teachings"). ^ Alexander (1980, pp. 26–27); Matzko (2007, p. 73) (noting, in addition, that the "Book of Mormon seems to contradict all five points of Calvinism"); Ford (2005, p. 88) ("[I]n the debate over human freedom, the Book of Mormon tends to resolve the issues similarly but not identically to the Methodist brand of Arminianism."). ^ Ford (2005, p. 83) (Book of Mormon "affirms original sin (2 Ne. 2), [and] human depravity (Mosiah 16:3) ..."); Alexander (1980, p. 26); Ostler (1991, p. 61) ("[A]lthough the Book of Mormon promulgates a notion of 'original sin', it is a 'hypothetical original sin' which does not actually afflict persons unless they reject the atonement. "); Lindgren (1986, p. 72) (describing the Book of Mormon as pessimistic about fundamental human nature, and the inability to overcome depravity through willfulness alone). ^ "Warfield - The Children in the Hands of the Arminians". www.monergism.com. ^ Hullinger (1992, p. 32) (comparing the earliest Mormonism with the Disciples of Christ's view of Biblical authority). ^ Hullinger (1992, p. 32) ("Like Shakers, [Smith] would restore the church and be led to the correct interpretation by new and constant revelation."). ^ Hullinger (1992, p. 32) ("Like other Protestants, he would see correct doctrine as a mark of the true church."). ^ Quinn (1994, p. 7) (describing Smith's earliest authority as charismatic authority); DePillis (1966, pp. 77–78) (noting that Smith based his authority, in part, on signs of divine approbation and special revelations, and that "[a]t first the Prophet had little to offer [converts] beyond baptism and his own impressive personality."). ^ Hullinger (1992, p. 32) ("Like other Protestants, he would see correct doctrine as a mark of the true church. But Smith added something else: a new scripture and a dual priesthood based not on apostolic succession, as in the case of the Roman Catholic claim to authority, but on prophetic succession. "); DePillis (1966, pp. 77, 81) (Smith "claimed prophetic succession through a dual priesthood that allegedly existed among the Hebrews. "); Quinn (1994, p. 7) (In 1834, Smith first began claiming that his authority arose within a line of succession through angelic visitors.). ^ Alexander (1980, p. 27). ^ DePillis (1966, p. 85) ("Mormonism as it evolved between Kirtland, Ohio and Nauvoo, Illinois, also rejected the pre-eminence of faith over works."). ^ a b Brodie (1971, p. 118) ("[E]ven the 'liars, sorcerers, adulterers, and whoremongers' were guaranteed telestial glory, and only a handful of unregenerates called the Sons of Perdition were to be eternally damned."). ^ a b Bushman (2005, pp. 421–22); Brodie (1971, p. 282). ^ a b Brooke (1994, p. 255); Brodie (1971, p. 300); Bushman (2005, p. 443) (noting that a modern Mormon interpretation of Smith's 1843 polygamy revelation ties both polygamy and monogamy to degrees of exaltation). ^ Buerger (1983, pp. 13–14, 36–37); Bushman (2005, pp. 497–98) (Second anointing was Smith's "attempt to deal with the theological problem of assurance" over which Calvinist theologians had argued for centuries. ); Brooke (1994, pp. 256–60) (arguing that unlike Calvinism, the power to grant unconditional salvation resided in the priest, rather than God alone, and therefore incorporated elements of Smith's magical tradition); Ostler (1991, pp. 77–78) (noting differences with the Calvinistic notion of persevering grace); Prince (1995, pp. 190–91) (Unlike other Mormon rituals necessary for salvation, "the second anointing guaranteed one's exaltation, and thus may be viewed as the crowning ordinance of Smith's ministry."). ^ Widmer (2000, pp. 119, 145).DePillis (1966, p. 84) ("To the older New England the ways and 'providences' of God were inscrutable. To a rebellious son of New England, living in an age of secret societies with strange signs and special ceremonies, God was quite scrutable, but only to those who were initiated. ")DePillis (1966, p. 84);Widmer (2000, p. 119); Alexander (1980, p. 27) (describing Smith's doctrine as "material anthropomorphism"); Bloom (1992, p. 101) ("Smith's God, after all, began as a man, and struggled heroically in and with time and space, rather after the pattern of colonial and revolutionary Americans. ")Bushman (2005, p. 421) ("Piece by piece, Joseph redefined the nature of God, giving Him a form and a body and locating Him in time and space. "); Bloom (1992, p. 101) ("Joseph Smith's God ... is finite. ... Exalted now into the heavens, God necessarily is still subject to the contingencies of time and space."). ^ Roberts (1909, p. 325). ^ DePillis (1966, p. 85); Widmer (2000, pp. 123–24) (discussing instances where Smith taught that God was a resurrected man). ^ Bushman (2005, pp. 420–21); Widmer (2000, p. 119). ^ Bushman (2005, pp. 455–56). ^ Widmer (2000, p. 131). ^ Bergera (1980, p. 15). ^ Widmer (2000, pp. 131–33) (describing Michael as a "lesser God in the Council of Gods". ); Kirkland (1984, p. 38) (noting that in Joseph Smith's endowment ceremony, the gods involved in the creation were "Elohim, Jehovah, and Michael," but unlike in modern Mormon theology, this "Jehovah" was not identified as Jesus). ^ Bergera (1980, p. 41) (describing the Adam–God doctrine as "that Adam was at once the spiritual as well as the physical father of all persons born on this world, including Jesus Christ"); Widmer (2000, p. 131) (Adam "was the father of the spirits in Heaven, as well as the father of their mortal bodies. ").Widmer (2000, pp. 132–33); Kirkland (1984, p. 39) (Young apparently believed that while Adam was mortal on the earth, his father Elohim, the "Grandfather in Heaven," temporarily took over Adam's role as the god of this planet). ^ Kirkland (1984, p. 39) ("After his death Adam returned to his exalted station as God the Father, and as such presided over Israel designated by the divine names Elohim or Jehovah."). ^ Widmer (2000, p. 131); Bergera (1980, p. 41) (describing the Adam–God doctrine as "that Adam was at once the spiritual as well as the physical father of all persons born on this world, including Jesus Christ"); Kirkland (1984, p. 39) (Adam "later begot Jesus, his firstborn spirit son, in the flesh"). ^ Widmer (2000, p. 139); Alexander (1980, p. 29) (noting that in 1912, the LDS First Presidency explicitly instructed missionaries to teach that Mormons worship God the Father, and not Adam, and discussing the official First Presidency statement of 1916). ^ "Doctrine and Covenants 130". www.lds.org. ^ Davies (2003, pp. 68–69):"This image of God reinforces Dan Vogel's argument that 'Mormonism was never trinitarian but consistently preferred heterodox definitions of God.'" DePillis (1966, p. 84); Ostling & Ostling (2007, pp. 310–12) (developing from monotheism in the late 1820s and 30s, LDS Church theology was clearly tritheistic by 1916). ^ Kirkland (1984, pp. 36, 41) (Jesus is regarded as Jehovah, the Old Testament god). ^ Ostling & Ostling (2007, p. 331) (In contrast to Christian orthodoxy, "[t]he Mormon Jesus is subordinate to the Father."). ^ Bickmore, Barry. "Of Simplicity, Oversimplification, and Monotheism". ^ Widmer (2000, pp. 119) (Mormons believe that God was once a man.). ^ Alexander (1980, p. 31) (Roberts and Widtsoe taught that "We must also have a mother who possesses the attributes of Godhood."). ^ Widmer (2000, p. 137) (20th century Mormon theologians retained Young's idea that spirit children were born in the same way that material children are born); Alexander (1980, p. 31) (noting the Heavenly Mother doctrine, Roberts and Widtsoe taught that "[s]exual relations will continue into eternity both for joy and for procreation."). ^ Ostling & Ostling (2007, pp. 305, 331) (Mormon doctrine is that humans are born of a heavenly Father and Mother; Jesus is described as "literally our elder brother"). ^ McMurrin (1965, p. 4). ^ Bushman (2005, p. 421) ("Piece by piece, Joseph redefined the nature of God, giving Him a form and a body and locating Him in time and space. "); Widmer (2000, pp. 119, 145); Ostling & Ostling (2007, p. 305) ("The Mormon God exists within time; in traditional Christian theology, God is outside time."). ^ Ostling & Ostling (2007, pp. 305, 331) (Mormon doctrine is that humans are coeternal with God, are of the same species. ^ Alexander (1980, p. 27) (describing Smith's doctrine as "material anthropomorphism"); DePillis (1966, p. 84); Ostling & Ostling (2007, p. 303) ("Mormon tradition, from Joseph Smith on, has tended to interpret literally ... anthropomorphic descriptions of God."). ^ "Temples in Ancient America, Etc., by Orson Pratt (Journal of Discourses, vol. 19, pp. 311-321)". mrm.org. ^ "The Reality of the Resurrection". byu.edu. ^ "B. H. Roberts: The Book of Mormon and the Atonement". byu.edu. ^ Alexander (1980, p. 29). ^ Alexander (1980, pp. 31–32) (discussing reasons why the LDS Church never issued an official soteriological statement based on the writings of Roberts, Widtsoe, and Talmage). ^ Alexander (1980, p. 30) (The soteriological orthodoxy created by Roberts, Widtsoe, and Talmage remained unchallenged until the advent of neo-orthodoxy). ^ White (1987, pp. 70–71); Alexander (1980, pp. 30, 32) (The rejection of original sin is a reversal of ideas implicit in the Book of Mormon. ); Ostling & Ostling (2007, pp. 330–31) ("All Mormon factions agree that LDS theology rejects the orthodox Christian doctrine of original sin."). ^ Gerald N. Lund, "The Fall of Man and His Redemption", Ensign, January 1990. ^ "Glimpses of Lehi's Jerusalem". byu.edu. ^ Alexander (1980, p. 31);White (1970, p. 16) (arguing that this Mormon orthodoxy "implies that the Fall is no fall". ); White (1987, pp. 71–72); Ostling & Ostling (2007, p. 332) ("Mormons believe that Adam's fall was a good thing, not the tragic event of traditional Christian understanding."). ^ Ostling & Ostling (2007, p. 336). ^ White (1987, pp. 80–81,83) (quoting language of Philippians 2:12); McMurrin (1965, pp. 66–67) (emphasis on works);Ostling & Ostling (2007, p. 335) ("On the faith-works scale, Mormons clearly tilt toward the works side."). ^ Alexander (1980, p. 27) (Joseph Smith extended the idea of perfection extended beyond the Protestant orthodoxy). ^ Ostling & Ostling (2007, p. 312) (noting that unlike Mormonism, the Methodist view of sanctification "was thoroughly trinitarian and retained a distinction between the creature and the creator"). ^ Bushman (2005, pp. 497–98) (those who were married eternally were then "sealed by the Holy Spirit of Promise" through the second anointing); Brooke (1994, pp. 256–57); Ostling & Ostling (2007, p. 199) (citing research of David John Buerger, who assumes that the LDS Church does not consider the second anointing ritual to be a prerequisite for achieving godhood in the afterlife). ^ Paul Toscano, Strangers in Paradox: Explorations in Mormon Theology (Salt Lake City: Signature Books, 1990), Chapter 14 Archived 2010-07-07 at the Wayback Machine. ^ "Joseph Smith—History 1". www.lds.org. ^ White (1987, p. xvi); McMurrin (1965, p. 111) (noting that Mormonism has become increasingly conservative, denying "the traditional liberalism of Mormon theology by favoring a negative description of human nature and the human predicament. "); Alexander (1980, p. 32) (the trend followed Protestant neo-orthodoxy but lacked "the vigor and certitude of its Protestant counterpart" because Mormons were limited by authoritative statements of Mormon progressives); White (1987, pp. 142, 144) (Mormon neo-orthodox scholars are "less extreme" than their Protestant counterparts). ^ White (1987, pp. 139–42). ^ White (1987, pp. xvi, 96–97); White (1970, pp. 12–17). ^ a b Riess & Tickle (2005, p. xiii). ^ Riess & Tickle (2005, p. xiii-xiv). ^ Riess & Tickle (2005, p. xiv). ^ White (1987, p. 140). ^ White (1987, pp. 174–75); Ostling & Ostling (2007, p. 330). ^ Ostling & Ostling (2007, p. 302). ^ White (1987, pp. 174–75); Ostling & Ostling (2007, pp. 308, 330) (noting writings by BYU scholars who describe God as omniscient, omnipotent, and omnipresent). ^ "Mormons Approaching Orthodoxy | Richard J. Mouw". First Things. Retrieved 2017-01-16. ^ "Mormons at the Forefront | Terryl Givens". First Things. Retrieved 2017-01-16. ^ Abanes (2007, p. 253); Bushman (2008, p. 2). ^ Van Biema, David (June 24, 2001), "Kingdom Come", TIME Magazine. ^ Eliason (2001, p. 102). ^ According to John Pottenger, although both Mormon Christianity and evangelical Christianity claim to be preaching true Christianity, they are nonetheless "diametrically opposed in many of their beliefs, theologies and practices." Pottenger (2007, p. 143). However, according to (Bloom 1992), Mormonism and American Evangelicalism (and American religion in general) have more in common at a deep level than either of them do with traditional European Christianity. ^ See references given in the introductory paragraph. ^ "Page Not Found". 4truth.net. ^ Simpson, James B. (May 26, 1996). "Bishop-Elect Not an Issues Person". Archives of the Episcopal Church. Retrieved 9 July 2017. ^ "Read and Study the Bible Online - Search, Find Verses". Bible Study Tools. ^ Kuhn, Josef (10 October 2011). "Poll: Three in four pastors say Mormons aren't Christian". The Washington Post. Religion News Service. ^ Mauss (1994); Sheperd & Sheperd (1984). ^ a b Riess & Tickle (2005). ^ "Style Guide – The Name of the Church", mormonnewsroom.org, accessed 6 April 2016. ^ Bushman, Claudia (2006). Contemporary Mormonism: Latter-day Saints in Modern America. Westport, Connecticut: Praeger Publishers. p. 158. ISBN 0-275-98933-X. OCLC 61178156. ^ M. Russell Ballard, "Sharing the Gospel Using the Internet", Liahona, June 2008. ^ See these articles (published in the church magazines) on various other faiths: Islam, Catholicism (see also these remarks by Hinckley about the passing of Pope John Paul II), The Church of England. ^ "We recognize the good in all churches. We recognize the value of religion generally. We say to everyone: live the teachings which you have received from your church. We invite you to come and learn from us, to see if we can add to those teachings and enhance your life and your understanding of things sacred and divine. Now we work with people of other faiths on common causes, many of them across the world. We recognize theological differences. We believe that we can disagree theologically without being disagreeable, and we hope to do so. We have been rather careful about surrendering in any way our doctrinal standards, anything of that kind as part of an ecumenical effort, but we certainly have worked with people, and do work with people, and want to work with other groups in tackling common social problems, things of that kind which are so much in need of attention these days throughout the world" (Gordon B. Hinckley, interview with Lawrence Spicer, London News Service, 28 August 1995). ^ Joseph Smith, History of the Church, vol. 1, ch. 1. "Corrupt" here is taken to refer to their beliefs rather than personal morality. See "Section 33: Declare My Gospel", Doctrine and Covenants Student Manual (Salt Lake City, Utah: LDS Church, 2002) p. 68. ^ The Contributor, August 1895, pp. 636–37. ^ History of the Church, 5:498. Abanes, Richard (2007), Inside Today's Mormonism, Harvest House Publishers . Alexander, Thomas G. (1980), "The Reconstruction of Mormon Doctrine: From Joseph Smith to Progressive Theology" (PDF), Sunstone, 5 (4): 24–33 . Bergera, Gary James (1980), "The Orson Pratt-Brigham Young Controversies: Conflict Within the Quorums, 1853 to 1868", Dialogue: A Journal of Mormon Thought, 13 (2): 7–49, archived from the original on 2011-06-14 . Bloom, Harold (1992), The American Religion: The Emergence of the Post-Christian Nation (1st ed. ), New York: Simon & Schuster, ISBN 978-0-671-67997-2 . Brodie, Fawn M. (1971), No Man Knows My History: The Life of Joseph Smith (2nd ed. ), New York: Knopf, ISBN 0-394-46967-4 . Brooke, John L. (1994), The Refiner's Fire: The Making of Mormon Cosmology, 1644–1844, Cambridge: Cambridge University Press . Bushman, Richard Lyman (2008), Mormonism: A Very Short Introduction, New York: Oxford University Press, ISBN 978-0-19-531030-6 . Bushman, Richard Lyman (2005), Joseph Smith: Rough Stone Rolling, New York: Knopf, ISBN 1-4000-4270-4 . Charles, Melodie Moench (1993), "Book of Mormon Christology", in Metcalfe, Brent Lee (ed. ), New Approaches to the Book of Mormon, Salt Lake City: Signature Books, pp. 81–114 . Davies, Douglas J. (2003), An Introduction to Mormonism, Cambridge: Cambridge University Press, ISBN 0-521-81738-2 . DePillis, Mario S. (1966), "The Quest for Religious Authority and the Rise of Mormonism" (PDF), Dialogue: A Journal of Mormon Thought, 1 (1): 70 . Duffy, John-Charles (2004), "Defending the Kingdom, Rethinking the Faith: How Apologetics is Reshaping Mormon Orthodoxy" (PDF), Sunstone, 132 (May): 22–55 . Eliason, Eric Alden (2001), Mormons and Mormonism: an introduction to an American world religion, University of Illinois Press . Ford, Clyde D. (2005), "Lehi on the Great Issues: Book of Mormon Theology in Early Nineteenth-Century Perspective" (PDF), Dialogue: A Journal of Mormon Thought, 38 (4): 75–96 . Gordon, Sarah Barringer (2002), The Mormon question: polygamy and constitutional conflict in nineteenth century America, UNC Press Books, p. 11 . Hill, Marvin S. (1969), "The Shaping of the Mormon Mind in New England and New York" (PDF), BYU Studies, 9 (3): 363–65 . Hill, Marvin S. (1989), Quest for Refuge: The Mormon Flight from American Pluralism, Salt Lake City, Utah: Signature Books, archived from the original on 2010-01-16 . Hullinger, Robert N. (1992), Joseph Smith's Response to Skepticism, Salt Lake City, Utah: Signature Books . Kirkland, Boyd (1984), "Jehovah as the Father: The Development of the Mormon Jehovah Doctrine" (PDF), Sunstone Magazine, 44 (Autumn): 36–44 . Kirkland, Boyd (1986), "Elohim and Jehovah in Mormonism and the Bible", Dialogue: A Journal of Mormon Thought, 19 (1): 77–93, archived from the original on 2011-06-13 . Larson, Stan (1978), "The King Follett Discourse: A Newly Amalgamated Text", BYU Studies, 18 (2): 193–208, archived from the original on 2010-08-26 . Lindgren, A. Bruce (1986), "Sign or Scripture: Approaches to the Book of Mormon", Dialogue: A Journal of Mormon Thought, 19 (1): 69 . Ludlow, Daniel H., ed. (1992), Encyclopedia of Mormonism, New York: Mcmillan, ISBN 0-02-904040-X . Martin Marty; Mormonism in Dialogue with Contemporary Christian Theologies; Mercer University Press; ISBN 978-0-88146-116-9;(Softcover December 2007). Matzko, John (2007), "The Encounter of the Young Joseph Smith with Presbyterianism" (PDF), Dialogue: A Journal of Mormon Thought, 40 (3): 68–84 . Mauss, Armand (1994), The Angel and the Beehive: The Mormon Struggle with Assimilation, Urbana: University of Illinois Press, ISBN 0-252-02071-5 . McMurrin, Sterling M. (1965), The Theological Foundations of the Mormon Religion, Salt Lake City: Signature Books, ISBN 1-56085-135-X . Ostler, Blake T. (1991), "Development of the Mormon Concept of Grace" (PDF), Dialogue: A Journal of Mormon Thought, 24 (1): 57–84 . Ostling, Richard; Ostling, Joan K. (2007), Mormon America: The Power and the Promise, New York: HarperOne, ISBN 978-0-06-143295-8 . Pottenger, John R. (2007), Reaping the whirlwind: liberal democracy and the religious axis, Georgetown University Press, p. 143 . Prince, Gregory A (1995), Power From On High: The Development of Mormon Priesthood, Salt Lake City: Signature Books, ISBN 1-56085-071-X . Quinn, D. Michael (1994), The Mormon Hierarchy: Origins of Power, Salt Lake City: Signature Books, ISBN 1-56085-056-6 . Riess, Jana; Tickle, Phyllis (2005), The book of Mormon: selections annotated & explained, SkyLight Paths Publishing . Roberts, B. H., ed. (1909), History of the Church of Jesus Christ of Latter-day Saints, 5, Salt Lake City: Deseret News, ISBN 0-87747-688-8 . Sheperd, Gordon; Sheperd, Gary (1984), "Mormonism in Secular Society: Changing Patterns in Official Ecclesiastical Rhetoric", Review of Religious Research, 26 (Sept.): 28–42, doi:10.2307/3511040 . Shipps, Jan (1985), Mormonism: The Story of a New Religious Tradition, Chicago: University of Illinois Press, ISBN 0-252-01417-0 . Shipps, Jan (1993), "'Is Mormonism Christian?' Reflections on a Complicated Question", BYU Studies, 33 (3) . Shipps, Jan (2000), Sojourner in the promised land: forty years among the Mormons, Chicago: University of Illinois Press, ISBN 0-252-02590-3 . Smith, Stephen L. (1980), "The Book of Mormon in a Biblical Culture", Journal of Mormon History, 7: 3–21 . Stark, Rodney; Neilson, Reid Larkin (2005), The rise of Mormonism, Columbia University Press . Toscano, Margaret; Toscano, Paul (1990), Strangers in Paradox: Explorations in Mormon Theology, Salt Lake City: Signature Books . Turner, John G. (2016), The Mormon Jesus: A Biography, Cambridge, Massachusetts and London: Belknap Press of Harvard University Press, ISBN 9780674737433 . Vogel, Dan (1993), "Anti-Universal Rhetoric in the Book of Mormon", in Metcalfe, Brent Lee (ed. ), New Approaches to the Book of Mormon, Salt Lake City: Signature Books, pp. 21–52 . White, O. Kendall, Jr. (1970), "The Transformation of Mormon Theology" (PDF), Dialogue: A Journal of Mormon Thought, 5 (2): 9–24 . White, O. Kendall, Jr. (1987), Mormon Neo-Orthodoxy: A Crisis Theology, Salt Lake City: Signature Books, ISBN 0-941214-52-4 . Widmer, Kurt (2000), Mormonism and the Nature of God: A Theological Evolution, 1830–1915, Jefferson, N.C.: McFarland . Mormon.org official informational website of the LDS Church. Utah Lighthouse Ministry - Protestant Christian website that defends their view of the Bible. "We Have Sinned Against You" - A leading evangelical speaks at the Mormon Tabernacle and says evangelicals have spread lies about LDS beliefs. Herbermann, Charles, ed. (1913). "Mormons" . Catholic Encyclopedia. New York: Robert Appleton Company.